This is the second part of a two-part series on the reasons for the sluggish U.S. economic “recovery” since the Great Recession, by Gerald Friedman, professor of economics at the University of Massachusetts and author of Microeconomics: Individual Choice in Communities. This post, from Friedman’s “Economy in Numbers” column in Dollars & Sense magazine, focuses on the failings of various government policy responses to the crisis. The recovery from the Great Recession has been so slow because government policy has not addressed the underlying problem: the weakness of demand that restrained growth before the recession and that ultimately brought on a crisis. Focused on the dramatic events of fall 2008, including the collapse of Lehman Brothers, policymakers approached the Great Recession as a financial crisis and sought to minimize the effects of the meltdown on the real economy, mainly by providing liquidity to the banking sector. While monetary policy has focused on protecting the financial system, including protecting financial firms from the consequences of their own actions, government has done less to address the real causes of economic malaise: declining domestic investment and the lack of effective demand. Monetary policy has been unable to spark recovery because low interest rates have not been enough to encourage businesses and consumers to invest. Instead, we need a much more robust fiscal policy to stimulate a stronger recovery. Determined not to repeat what orthodox economists saw as the main cause of the Great Depression—a “tight” money supply—the Federal Reserve responded very aggressively to the crisis in 2007 and 2008. 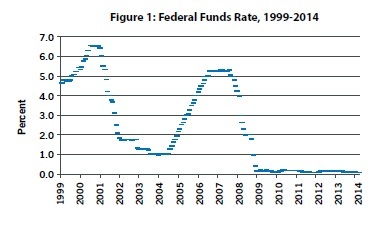 The Fed drove its main target short-term interest rate, the federal funds rate, down to an unprecedented near-zero level. Even at interest rates below zero in real (inflation-adjusted) terms, however, effective demand has been so depressed and so much unused productive capacity has remained that banks have found few borrowers. The Federal Reserve tries to encourage economic expansion and job creation by driving down the interest rate on Treasury bills in order to indirectly force down the interest rates corporations pay on their borrowing. This policy has become less effective over time because investors have been insisting on a larger risk premium for lending to corporations. 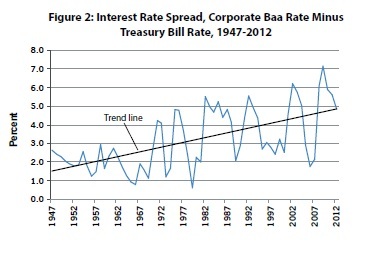 Since the 1970s, the rate on corporate bonds has been drifting up relative to treasury rates: Interest rates on corporate bonds have risen an average of 50 basis points (0.5 percentage points) each decade, relative to Treasury bills. The recovery from the 2001 recession was fueled by consumer spending—based on increasing debt and rising asset values. On the eve of the Great Recession, household debt payments were an unprecedented 18% of disposable personal income. As the crisis hit, household net worth plunged by over $13 trillion, led by falling home prices, and consumer spending fell accordingly. Since the recession, households have increased saving to bring down their debt levels. While this is good for individual balance sheets, it has meant reduced spending, lowering economy-wide demand and income. 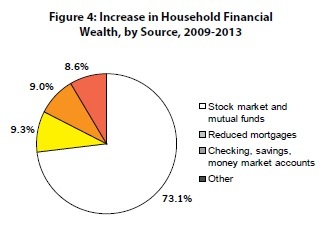 Average household wealth has since recovered, but the effect on consumer spending has been muted because most of the recovery has been in stocks, assets which are owned primarily by a small (and rich) portion of the U.S. population. As in past recessions, the federal government responded to higher levels of unemployment through deficit spending. 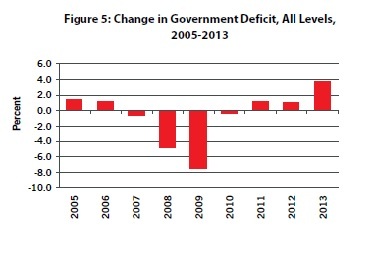 Large increases in deficit spending in 2008 and 2009 helped to halt the economic collapse at the beginning of the Great Recession. From there, however, the allgovernment deficit (including state and local governments, which traditionally run surpluses) swung heavily toward surplus. Despite persistently high levels of unemployment, government fiscal policy has been contractionary every year since 2010, with rising surpluses slowing an already anemic economic recovery. 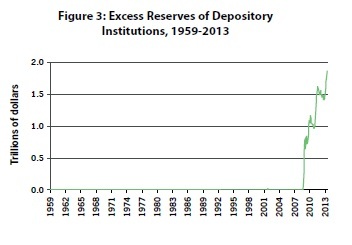 SOURCES: Board of Governors of the Federal Reserve System, series FEDFUNDS; Baa corporate bond yields minus 3-Month Treasury Bill: Secondary Market Rate (TB3MS); Board of Governors of the Federal Reserve System, series EXCRESNS; Federal Reserve Board, “Household Debt Service and Financial Obligations Ratios” for March 12, 2014 (federalreserve.gov); Household Financial Balance Sheet and Economic Recovery: Federal Reserve, Z.1 Statistical Release for June 5, 2014.